Two Hundred Ninety-Five, doesn’t mean a whole lot to the average sports fan. It’s not as prominent as 4,256 (Pete Rose career hits), 2,632(Cal Ripken’s consecutive games played), or even 894 (Wayne Gretzky’s career goals), but to hard-core Milwaukee Admirals fans that’s a pretty accomplished number. 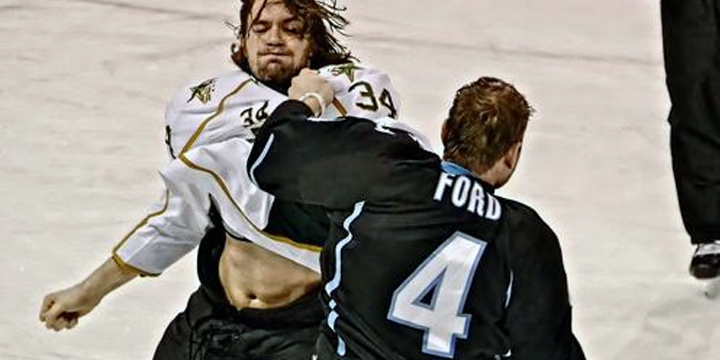 Last night Milwaukee Admiral’s Defenseman Scott Ford became the Admirals All-Time AHL games played leader when his team took the ice against Grand Rapids (the Admirals won 4-1). The record that started in 2008 by the British Columbia native, was postponed for a brief stint earlier this season when he played for Peoria, has come to fruition. Ford surpassed former teammate Kelsey Wilson (294). It’s a unique record considering that many players in this league move around to different teams as well as get called up to the NHL during their careers (the Admirals are the farm team for the Nashville Predators) it’s hard to stay in one place for that long. Congratulation #4, you are now #1! 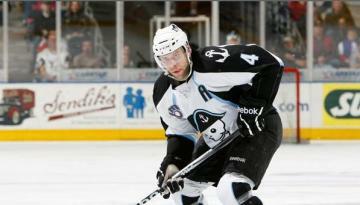 This entry was posted in AHL, hockey, Milwaukee Admirals, sports and tagged AHL, Milwaukee Admirals, Scott Ford. Bookmark the permalink. I have watched him play almost half those games! The Ads need at least a couple more wins to keep their playoff appearance streak going.